In writing this "Short History of Dromore Methodism," I should like to acknowledge the help of the late James Gracey, who had already done some valuable research, particularly in relation to the first hundred years. Mr. Gracey, until his removal from Dromore, a few years ago, had been a long-standing member of the Church, which he greatly loved, and served with unstinting devotion, over many years. Though he resided in Dunmurry during the latter years of his life, he continued to follow the affairs of the Church of his upbringing, and was eagerly looking forward to this Bicentenary year. However, he was not permitted to live to see it. To the great sorrow of their many friends, he and his dear wife were called to higher service, in November, 1978, within a few days of each other. This short history might fittingly be dedicated to their memory. I am also grateful for the facilities provided by the, recently established, Dromore public Library, especially for the historical information contained in the booklet, "A Ramble through Dromore," by John F. Milligan. The Wesley Historical Society, Aldersgate House, Belfast, has put me in its debt, placing its library and records at my disposal. Mrs. Victor Kelly, the Archivest, was most co-operative and patient, and always ready to give expert advice. Gratitude is due to Mr. Wilfred Green, Broomhedge, and to Mr. Ernest Scott, Armagh, for their generous assistance with the photography. Finally, I wish to thank Mr. G. Vivan Brown and my wife, who read over the script, making valuable suggestions and comments. METHODISM came to Dromore in the year 1779 as part of the ever-widening influence of the eighteenth century revival. This remarkable revival began with the conversion of John Wesley in a room in Aldersgate Street in London on 24th May, 1738. Wesley's immediate response to his new-found experience of the grace of God was to go forth to offer Christ to all who would listen. His own brother, Charles, was converted about the same time and soon became involved, not only as preacher, but also as hymn-writer, for which he was to become famous. Soon many other itinerant preachers were enrolled and before long the Gospel spread in Apostolic fashion, touching not only cities and towns but also reaching villages and rural areas. John Wesley's first visit to Ireland was in 1747, but it was not he who introduced Methodism to this country. This honour belongs to one of his Preachers, Thomas Williams, who was himself converted through the preaching of Charles Wesley. He came to Dublin in 1746 and soon had gathered together a Society of three-hundred members. In all, John Wesley visited Ireland twenty-one times. His earlier tours were mostly South and West of Dublin. It was not until his sixth visit that he came northward, in the year 1756. Through his preaching and that of George Whitfield, one of his colleagues, Methodism was established in Lisburn about this time. Wesley himself, however, does not appear to have preached in Dromore, though it is highly probable that he passed through it more than once. He was a meticulous diarist and left behind him the precious legacy known as his "Journals," which give a day by day account of his movements. Had he ministered here he would, without doubt, have mentioned it with his usual comments, favourable or unfavourable. There is but one reference to Dromore in his Journal entered on Friday 3rd April, 1767." At the end of Dromore I met Robert Williams who showed me the way to Newry." Methodist Work in Dromore was the result of evangelical outreach on the part of the Lisburn Circuit in 1779. In that year one of the three Minister's stationed in Lisburn was a young man called William Myles. He came over one day to Dromore, took his stand in the street and proceeded to call sinners to repentance. As frequently happened in those days with the Methodist preacher, he met with threatening opposition. A man described as an "excise officer" came forward under the influence of drink and with upraised arm swore he would kill the preacher, but an inn-keeper struck his arm and, diverting the blow, frustrated his purpose. The word of God prevailed and a number of bystanders were won for Christ. Those early converts became the first Dromore Methodists. A Society was immediately formed as part of the Lisburn Circuit. Among the converts in those early days was Maria McNeill, described as "a poor, but respectable widow". Mrs. McNeill opened her home in Meeting Street for Methodist Services. By 1804 this accommodation proved inadequate for the increasing Congregation. The use of the Market house was sought but refused. Consent of Conference was obtained for the erection of a Church, but as no means were available to build, the Society had be content with two small houses in Meeting Street. Out of these a large room was constructed in which services were held for eleven years. Methodists work soon spread beyond the environs of the town mainly through the influence of lay folk. A fine example of this is the story of one called James Hamilton of Ballykeel, some four miles out in country. He was known in the area as "a wild young man," but an aunt, a Mrs. Manown, had a great concern for him. This lady, a Methodist from Downpatrick, often visited him and through her he was converted to God. After this, Methodist Preachers were invited to his house and soon a class was formed of which he was the Leader for sixty years. One of the first members of this class was a young man called Samuel McDowell of Drumaknockan, who was soon after appointed as Leader and Local Preacher. He laboured with great success in the Dromore district until 1808, when he went out as a missionary to Newfoundland. The present Church building was not the first proper place of worship of the Dromore congregation. It was preceded by a Church built in 1815. This came about mainly through the enthusiam of a man called John Ross. Ross was a native of Clare, near Lurgan. He came to live in Dromore as a young man and having given his heart to the Lord began to take part in the meetings of the Society. Very soon he became a most acceptable Local Preacher and Class Leader. For forty years he watched over the society with such care and devotion that he is justly called "the father of Dromore Methodism." This worthy man managed to secure the excellent site on which our present property stands. The ground was leased to the Methodists by Bishop John Leslie, the Church of Ireland Bishop of Dromore at that time. The Church is fortunate in that it still has in its possession the original copy of the lease. A photo copy of which appears overleaf. "WE John Lord Bishop of Dromore do hereby grant our Licence unto John Ross of Dromore in the Co. Down, Merchant, to erect a House of Worship for the use of persons professing Methodism in Dromore and its vicinity on "that piece of ground lately occupied by James Woods in the rear of Gallows Street, Dromore. Bounded on one side by Mr. Bodel's field, on the other by William Haddock's garden, on the other side by the road leading to Moira and on the remaining side by the garden occupied by James Woods" the same being devised to the said John Ross by Meridith Darby of the Parish of Dromore in the said County, Yeoman our immediate lease by Indenture of Lease bearing date the sixth day of May in the year of our lord one thousand eight hundred and fourteen. Given under our Hand and Episcopal Seal at Dromore House on this 23rd day of July in the year of our Lord God one thousand eight hundred and fourteen, and of our Consecration, the third." J. Dromore "Lord Bishop of Dromore "
Having secured the site, John Ross wasted no time in proceeding with the building of the new Church. The Church was opened and dedicated on "the quarterly Love Feast Day" in September 1815. The collection amounted to ?.1.11.6 but the congregation was so large many could not get in. This building was a plain structure with forms and a desk. Later a pulpit was added. The preacher for the opening service was Rev. William Kidd, who took as his text Nehemia 8:4. "Ezra the scribe stood on a pulpit of wood which they had made for the purpose." This church, which probably occupied only a corner of the commodious site, remained in use for fifty-six years. But as the Methodists continued to grow in number it became evident that a larger place of worship was needed. So it is recorded that on the 1st September, 1867, a tea-meeting was called to explore the possibility of building a larger Church. Unfortunately the weather was severe on that day and consequently the attendance was small. It was decided at this meeting that "a circular with reference to the matter be sent to all members and seat-holders asking for their opinions." The outcome was a decision to erect the new Church, and immediately a committee was formed to consider the steps to be taken. 'This committee was chaired by Rev. Richard Maxwell, with James McDade as secretary and James Frackelton as treasurer. The Architect subsequently appointed was a Mr. William Gray, M.R.I.A., of Belfast. The foundation stone was laid on 28th April, 1870, by James Frackelton in the presence of a large assembly. Dromore Methodist Church as it stands to-day was opened for worship on Sunday 19th March, 1871. The preacher on that occasion was Rev. William P. Appelbey, B.D., L.L.B. The opening celebrations were continued into the next Sunday, when Rev. William Arthur, President of the Methodist College, preached in the morning and Rev. Robert G. Jones in the evening. After a time, because ofthe numerous applications for pews, a gallery was added to the Church, providing accommodation for 350 people. The successful conclusion of this building scheme was due in large measure to the enthusiasm and perseverance of James McDade, who gave outstanding leadership in the Society at that time. The cost of the building was ?2,000. The Manse was built in 1878 and the school room in 1896. It was not, however; until the late nineteen-thirties that the kitchen and toilets at the rear were added. The Church owns the site on which the property stands mainly through the generosity of a Miss Pantridge, who gave the money to purchase it in the latter part of the nineteenth century. Rumour has it that plans to buy the ground were set in motion through Monsignor Cartnew, of the Roman Catholic Church across the road. It is said that he sent for James McDade and told him that he had heard that the Methodist site, together with the Roman Catholic site, were to be put into the Land Commissions, and implored him to get the cash and purchase the ground without delay. It was then that Miss Pantridge graciously provided the purchasing money. The small car park to the South of the Church was laid in 1966. A Masonic Hall, which stood on this site was purchased by the Church, but being in poor condition it was demolished to make way for the enclosed park. It may come as a surprise to many that at one time there were three Methodist Churches in Dromore working side by side. In addition to the one referred to already there was a "Primitive Wesleyan Church" and a branch of the "Methodist New Connexion" body. The Primitives came into existence through a serious split in Methodism which occurred in the year 1818. It arose over the administration, of the sacraments. During the early years of the Methodist movement, Methodists looked to the established Church for such ministries as the sacraments of baptism and the Lord's Supper. This was chiefly due to the fact that Wesley in his earlier years had no wish to break away from the Chruch of England of which he was an ordained minister. He wanted to keep the evangelical movement, he had been raised up under God to lead, within the mother Church. However, he himself in the end found it impossible to hold to this position. Besides, the widespread growth of Methodism and the fact that many of the converts had no previous connection with the state Church, altered the pattern of things. In addition, in many places there was no desire on the part of the Anglican Church to cater for the Methodists. Very often the zeal and enthusiasm of Wesley's followers was an embarrassment to them and hard to contain. Consequently a deep desire arose among the Methodists to have the sacraments administered in their own Churches by their own ministers. In Ireland Conference resisted the pleas for change in this matter, until eventually permission was granted to certain Northern Circuits, but this was soon extended to the whole country. Unfortunately, this issue created a deep division, and a section of the Church led by Rev. Adam Averell, broke away to form the "Primitive Wesleyan Methodist Church". Their members elected to continue their former relationship with the Church of Ireland and to remain as Methodists within that Church. The convictions of the Primitive were sincere and intense and, under the leadership of Averell, Primitive places of worship were opened in many parts of the country. (It should be noted here, however, that the Primitive Methodist Church established in England, about the same time, had no connection with the Irish Primitive movement and originated for an entirely different reason). This upheaval in Methodism greatly disturbed the movement and brought unrest to almost every Circuit. Dromore was no exception, but for a few years at any rate the Society was preserved intact, mainly through the wise counsel and Godly influence of James Ross. However, after a time the Primitives gained a footing in the town and, through the instrumentality of Rev. John Mcllroy, a house was rented in Gallows Street in which services were held in 1827. Three years later a Church was opened. Exactly where this Church was sited we are not sure. It is appropriate at this point to relate that a Primitive Methodist Society was established in Dromara and a Church erected and opened on 13th September, 1835. This Society later became part of the Dromore Circuit. The story of the building of the Dromara Church makes interesting reading as recorded in Crookshank's History. It was largely through the energies and faith of a dedicated Layman by the name of Hill, who is described as "a man of deep piety and liberal spirit." He allowed no obstacle to daunt him in his resolve to build a place of worship. "He laboured with his own hands and prayed and laboured, night and day, until, without having one shilling to assist him, the object of his prayerful solicitude was accomplished." Methodist work in Dromara was discontinued early in the present century. The Church remained in the care of Dromore long after it ceased to be used for services. For a time it was let to the Education Authority for use as a Technical School. Eventually, in 1969, it was sold to the local Apprentice Boys. The Primitive Weslyan Methodists continued for about sixty years working and witnessing alongside Wesleyan causes in many parts of the land, with the passage of time, however, most of the original differences were lost sight of and by 1878 a union was effected. The adjectives in their titles were dropped and the term "Methodism" alone was henceforth used. It is worth noting here that the name "Wesleyan" written in the stone-work over the Dromore Church door reflects the days of division, the Church having been built shortly before the Union. Conference. About a dozen Methodist New Connexion Churches were established in Ireland including one in Dromore. It is interesting to note that two of the sister Churches on the Lisburn and Dromore Circuit, Broomhedge and Priesthill, had their origins in this branch of Methodism. We know, however, very little about the history of the New Connexion Society in Dromore, how long it survived of where its place of worship was located. This brand Methodism eventually lost its, identity, having merged with the larger Connexion in 1905. WHILE it is comparatively easy to write about bricks and mortar and matters of administration in the history of a Church, it is quite impossible to give an account of the things that have to do with its witness and influence. Here we are dealing with the realm of the spiritual and the unseen , something which can never be truly assessed. We are confident, however, that the Methodist Church in Dromore has for two centuries sought to accomplish the purpose which John Wesley believed God had raised up Methodism to fulfil, that of "Spreading scriptural holiness throughout the land." It has witnessed to the saving gospel of Jesus Christ and tried faithfully to serve the community in His name. The work has been carried on Mainly along the traditional lines characteristic of our denomination. In the early days of Methodism and indeed for several generations the Class Meeting played a significant role. Every Society was divided up into groups or classes each under la dedicated Class Leader. Through the Class members found fellowship and .were able to care for one another. 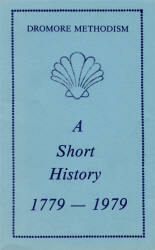 The records show that at one time Dromore Society had as many as twelve Classes. These met regularly and were located as follows: Mother's Close, Magherabeg, Rockhill, Greenogue, Waterside, Ballykeel (upper) Ballykeel (lower), with five Classes in the town itself. The Cottage Meeting was once an effective means of witness and outreach in Methodism, particularly in the rural areas. Dromore seems to have been very active in this respect, and some of the older members of the Church have cherished memories of attending such meetings in their childhood. A long list of the areas and homes where regular meetings were held is recorded in an old schedule book. It includes the following: Milebush Farm, Drumandoney, Lurganbann (Mrs. Weir's), Ballinaris (Mrs. Kilpatrick's), Ballkeel (Mrs. R. Watson's), Drumillen (Mrs. Thompson's), Backnamullagh (Mr. Bowman's and Mr.Hutchinson's), Old Hillsborough Road (Mr. McKee's) and Rampart Street (Miss Arlow's). Most of these were monthly preaching places, some were fortnightly and a number quarterly. Services were also conducted regularly over many years in Orange Halls and. School Houses, in places such as, Quilly, Ballymacormick, Magherabeg, Upper Ballykeel, Drumillen and Skeogh. One minister records that, "More places are open if one could but find the time." This indeed seems to have been a period of remarkable opportunity, when the gospel was offered to many people in many places. The fact that, for most of its history, Dromore was a single Society Circuit did enable the minister to carry on a local ministry of this kind in a way which, under any other circumstances, would not have been possible. An attempt was made in more recent times to reopen regular services in some of the halls already mentioned, but without success. Dromore has experienced periods of revival at different times over the years. Crookshank in his "History of Methodism," tells of the effect of the 1859 Revival. He writes "In the gracious fruits of the revival the Dromore Circuit, where the Rev. Oliver McCutcheon was stationed, participated largely, much prayer was offered, the congregation increased, and at length the Lord answered by fire. The Holy Ghost descended in converting power, first in the houses of the people and afterwards on the congregations; many were cut to the heart and led to cry for mercy. It was a deeply interesting spectacle, and on one occasion those recently brought to a knowledge of the truth, marched in solemn procession through the streets, singing hymns, and then crowded into the Wesleyan Chapel. The country parts of the Circuit, however, shared even more largely than the town in these showers of blessing." Then earlier in the present century, when the famous Ulster evangelist Billy Spence was to the fore, a wonderful mission took place through which many were converted. It is reported that on one particular night the Church was so crowded that the gallery creaked and was in great danger of collapsing. John Graham, father of Sir Clarence Graham, stood up in the midst of the tension and begged for God's sake ? that the congregation keep still and not to allow any more in. Two strong beams were put in immediately after this to support the gallery. In its care of young people the Church over the years has fulfilled a quiet but effective ministry. When the Band of Hope Temperance Organization was a force in the community, Dromore was to the forefront. There were periods early in this century when the Band of Hope group, under Methodist auspices had on its rolls around two-hundred girls and '.rays with attendances at regular meetings averaging one-hundred. For about half a century the Church continued, through this organization, to uphold temperance ideals among its young people. With the passing of the years, numbers declined, even as the Band of Hope regrettably diminished everywhere in influence and appeal. The Christian Endeavour movement was not long in existence before it was adopted by Dromore. It came to Ireland from the United States in the last decade of the nineteenth century, and by 1904 both a Junior and young Peoples' Society were formed in Dromore. Very soon Junior membership had reached seventy, and the Young Peoples' Society had an enrolment of eighty. Membership in the society never again reached the same high level as was experienced at the beginning. Nevertheless, over the years Christian Endeavour has played a worthy part in the life of the Church, promoting evangelism among young people, providing fellowship and training in Christian service and witness. Many attached to the congregation today are grateful for its influence upon their lives. Being an interdenominational organization, it has always been open to receive young people of other Churches into its fellowship, yet the rise and fall in membership over the years has always been related to the number of Methodists available to join. In keeping with the trends of the times, C.E. generally is being replaced by other types of Youth Groups. Uniformed organizations have not played a prominent part in the life of the Church. The Second Dromore Boys' Brigade Company was started in 1942 and ran successfully for seven years. It had to be wound up chiefly because of new Companies that were established in the town by Churches of other denominations. The First Dromore Girl Guides Company was introduced by Mrs. Clarence Graham (later Lady Graham) because of her concern for the welfare of girls in the town and district. It was opened in 1941 with the Methodist Church hall as its headquarters. This Company continues to flourish, and many girls have greatly benefited over the years from its training and fellowship. It is an "open " Company and , while there are always some Methodist members on the rolls, most of the girls are drawn from the wider community. "This window was installed by the First Dromore Company Girl Guides, to give grateful thanks to God for, and to perpetuate the memory of, the kindness, love and leadership of their founder and First Captain. She gave herself continuously without counting the cost." One of the unique facilities of Dromore Church at one time was the large and accommodating lending library. An account of the opening of this library, written by Rev. Samuel Weir, appeared in the "Irish Christain Advocate" on 1st February, 1884. It reads as follows: "To all ministers who travelled this Circuit, and to all friends of the cause here, it will be interesting to learn that after six years of prayerful and persevering labour, Mr. James McDade has succeeded in purchasing and collecting one of the best public libraries connected with any congregation in the United Kingdom. There are in it 1625 volumes, all valuable books and of varied character, suited to minister, student, Sunday School teacher and scholar and to the general public. Here are such books as `The Life and works of Christ' by Dr. Geikie, and most interesting and profitable stories from our own Bookroom catalogue, and from the catalogue of the Religious Tract Society. This week I had the pleasure of declaring the library open to the public, any of w:iom, for a mere nominal sum, may receive any book every week he pleases. Already the benefit derived from the choice selection has begun, but it will take years fully to disclose the advantages which our good brother McDade has conferred upon this town and neighbourhood by this his latest work of indomitable zeal. Would that some of the brethren of other Circuits could see for themselves what has been done! It might stimulate them to go and do likewise. It is but right to add that this library could not have been opened so soon only for the self sacrificing efforts of the Misses Dickinson of Dromore who with their usual kindness covered upwards of 1000 books with black linen. Other ladies emulating their noble example completing the work in the best possible manner." Little else is known about this excellent library or how long it was of service. We do know, however, that it was still there in 1909, as an entry in the Schedule Book of that time indicates that "Mr. McDade's Books" were insured for ?200. This is exactly the same value a was placed on the church hall itself! The Sunday School has always been at the centre of the Church's work amongst the young. In this field Dromore has not been found wanting. Over many year there was a flourishing afternoon School which catered for the children of every denomination, and at one time there were as many as two-hundred pupils on the rolls, with average attendances of around one-hundred and fifty. The time came, however, when afternoon schools were opened in some of the other Churches in the town. This brought a great fall in attendances, and in 1963 the Methodist afternoon school was closed. The morning School, which has been mainly for the children of our Methodist families, continues to do valuable work. It has never been a large School; the numbers have risen and fallen over the years in relation to our Junior Membership. Today there are thirty children on the rolls. Until 1976 the time of meeting was 10.00 a.m. but in order to facilitate families living in the country, a decision was taken to hold the school during morning service as is the practice in many other places. The children share in the early part of the service and then retire to their classes. This experiment seems to be acceptable to both parents and teachers. It speaks well for the life of the congregation that it has been possible to find twelve teachers who do duty on a rota basis, which means that no teacher is deprived of morning worship except for a few months in the year. An important feature of the Sunday School is its emphasis on missionary work through the Junior Missionary Association. The J.M.A. collectors, actively assisted and encouraged by some adult members of the congregation, raise considerable amounts year by year. Many D.S.O. Medals and Bars were presented this year when the total collected was ?360, an increase of ?84 over last year. Missionary interests are also energetically promoted by the local Branch of the "Methodist Women's Association." This group operated for many years under the former title, "Women's Department." The Branch meetings are held monthly, and the members enjoy the fellowship, and scope for Christian service these meetings provide. Large sums of money are raised year by year, mainly through an annual sale and the Missionary boxes. Dromore seems to have been a fruitful recruiting ground for the Christian Ministry. There is a long list of candidates which includes the following: Henry Price, a talented man and an able preacher; Robert G. Jones, whose son George C. Jones, L.L.D., became a prominent minister in the American Methodist Church; John Saul, D.D., L.L.D., who was a good linguist, and whose three sons entered the Wesleyan Methodist Church in England; James Black, whose two brothers became ministers in the Presbyterian Church: James Thompson and Joseph Frazer, who went to America; Samuel Cowdy and George C. Mayes, who served under the British Conference; Joseph Spence and Samuel McDade, who emigrated to Australia and served in the Methodist Church there; George W. Spence, who became a minister in New Zealand; John Scott McDade, John Magill, Henry McDowell, Hill Linsday and Henry Frackelton, all of whom served under the Irish Conference. In more recent times, Dromore gave Rev. Robert C. Acheson, who rendered fine service in Burma before going to America, and Duncan Alderdice, who is at present Superintendent of the Fivemiletown Circuit. TI would seem that Conference had difficulty over the years in establishing Dromore Circuit-wise. This may have been partly due to its geographical location. It lies on the edge of two Districts and is not close to any other sister Society, being almost equidistant from Banbridge, Moira, Lurgan and Lisburn. The Society, having been brought into being by the Lisburn Circuit, then in the Belfast District, remained part of that Circuit for fifty-six years. In the year 1835 Conference decided to unite Dromore with Moira, which was then on the old Newry District. This in our day may appear to be a strange union as Moira scams to have few links with Dromore. However, in those far-off days, when the main thoroughfares were not as well defined as they are now, Moira and Dromore were considered to be easily accessible to one another. Indeed, the road that runs past the Church in Dromore was sometimes called the Moira Road. Moreover. the horse-back preacher found it comparatively easy to negotiate the criss-cross of roads between the two places. In 1854 this union with Moira was discontinued, and Dromore became a Circuit on its own. The link with Moira, however, was not completely broken. Conference laid down that the Dromore Minister would supply one Sunday morning in four on the Moira Circuit. The exact entry under "Stations" in the Minutes of Conference reads, "Dromore: Edward Harpur, who is to supply one forenoon each month on the Moira Circuit." By the year 1859 Dromore again came under the Belfast District Synod. A reorganization of Districts took place that year, when the Newry District became known as the Portadown District with little change in terms of Circuits covered by the Synod, except that Dromore was transferred to Belfast, and Aughnacloy in Tyrone, on the Enniskillen and Clones District, to Portadown. The Enniskillen and Clones Districts had been united to form one District the year before, in 1858. There are a few entries in the 1878 minutes of Conference involving Dromore which must remain a mystery. In the list of Stations in the Belfast District, Circuit No. 136 reads "Dromore, Thomas Knox," but No. 137 reads "Banbridge and Dromore; Thomas Pearson, Richard Little (Ballynahinch)." In the same "Minutes," Circuit No. 157 reads "Banbridge; William J. Storey." At this point in time it is obviously impossible to sort out the apparent confusion inherent in these Minute entries. It may have had something to do with the overlapping of the Primitive and Wesleyan branches of Methodism, which achieved union in 1878. Or perhaps it is due to a slip on the part of the Editorial secretary of the Minutes of Conference! Dromore was to remain undisturbed as a single Society Circuit for the next one hundred and twenty-two years. In 1976 it was united with Lisburn to form the present "Lisburn and Dromore Circuit." Thus after one hundred and forty-one years' separation, Dromore Society was linked again with the Circuit which, under God, gave it birth. Naturally, Dromore Methodists were reluctant to lose their identity as a Circuit but various pressures within the Church as a whole made this inevitable. A growing shortage of ministers and ever increasing costs were to bring about several unions within the Connexion during the nineteen sixties and seventies. In 1962 Conference set up what became known as "The Manpower Committee." Its terms of reference were "to consider the present structure of Stations throughout the country so that our Ministerial manpower be better deployed and our work more effectively discharged having regard to the distribution of the population in Ireland today and the peculiar needs of various areas." This high-powered Committee carried on deliberations from several years but it was not until 1967 that Dromore Circuit received a letter from the Secretary of the Committee suggesting that the Quarterly Board should consider the possibility of taking responsibility for Blackscull Society on Moira Circuit. This proposal was favourably received, but the matter was deferred for a year. Apparently, no further steps were taken in this direction but, later it was asked that consideration be given to amalgamation with Banbridge Circuit. As a result, some informal talks took place with Banbridge officials, but no action was taken. On the 3rd October, 1968, a deputation from the Manpower Committee met with Circuit officials. The Dromore-Banbridge Scheme was given further consideration, but it was at this meeting that union with Lisburn was first mentioned, and opened up for careful exploration. The matter continued to simmer at Connexional, District and Circuit level for the next few years, when responsibility for negotiations was transferred to the newly formed Down District Synod. The various options were reassessed and finally at a special Quarterly Meeting held on 3rd April, 1976, it was agreed that Dromore should link up with the Lisburn Circuit. The voting for this proposal was, 6 for, 1 neutral and 1 against. Immediately, negotiations were entered into with Lisburn Quarterly Board and a satisfactory basic of union agreed. Conference gave its approval to the scheme in the following terms: "That the Lisburn and Dromore Circuits be united and staffed by two ministers, under the name of Lisburn and Dromore." The final Quarterly Meeting of the Dromore Circuit met on 24th June, 1976, presided over by the retiring Superintendent, Rev. E. Arnold Edwards. The Rev. J. Lennox Booth, newly appointed to the Lisburn and Dromore Circuit, was given pastoral oversight over the Dromore Society in addition to Priesthill and Broomhedge. Mr. Booth was officially welcomed to the circuit and installed in Dromore Church in a service at 8.00 p.m. on Sunday, 11th July, in the presence of a large congregation representing the whole of the new Circuit. This service was conducted by the Superintendent, Rev. J. Winston Good. Mr. John Mitchell, senior Society Steward, Dromore, welcomed Rev. J. Lennox Booth and his family on behalf of the Circuit. The new minister moved into Broomhedge manse, but this was considered to be a temporary arrangement, pending a final settlement as to where the second minister should reside. Broomhedge manse was in need of extensive renovations and Dromore manse was in a similar condition. Synod had recommended that consideration be given to selling or letting both the existing manses and securing a new residence more central to the three congregations. The point had been reached when Dromore house was about to be offered for sale, but after several meetings of the Quarterly Meeting and special committees it was decided to do an extensive scheme of repairs on the Dromore property. This proved to be a major task as the house was found to be in even worse condition than had been expected, mainly because of structural deterioration and dampness. In addition, an almost complete refurnishing was necessary. However, after twelve months, the work was completed, and Rev. J. Lennox Booth and family took up residence on 3rd July, 1978. This is now a well-equipped modern home and should be trouble-free for some years to come. Grants towards the repairs were received from the Northern Ireland Housing Executive and from the Home Mission Fund towards the furnishings. Nevertheless a considerable sum of money has had to be raised on the Circuit for this project which is now almost free of debt. The Dromore congregation has contributed generously to the repair fund, but without the support of the rest of the new Circuit the manse could not have been restored. At the time of the union in 1976 Dromore had graciously conceded the loss of the manse and the resident minister. However this subsquent change of policy has restored both, and for this the Dromore people are most grateful. 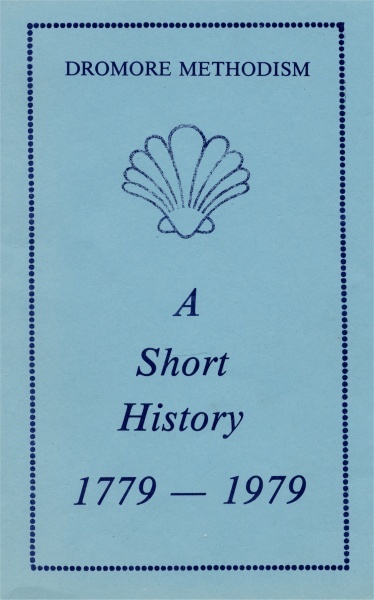 This brief outline of the history of Dromore Methodism since 1779, leaves much ground uncovered. Shortage of space and lack of information have made it impossible to give any real account of the contributions made over the generations, by a host of dedicated men and women. Unfortunately, there is no proper list of those Methodists from Dromore, whom the great Lord of the Church numbers among his "good and faithful servants." Undoubtedly He has entered the names of many whom a human chronicler would leave out. It is certainly true, however, that but for the consecration, sacrifice and vision of those who have borne a faithful witness, generation after generation, there would be no Bicentenary to celebrate. The Methodists of to-day, in Dromore, are grateful to God the great heritage which is theirs. They look forward to the future with hope, and face the third century of Methodism with confidence, remembering that Jesus Christ, the Head of the Church, is "the same yesterday, to-day and forever." The town of Dromore, in recent times, has been passing through a period of considerable change and redevelopement. A number of accomodating housing estates have been built, and radical steps have been taken to rid the town of out-of-date dwellings. Whole streets of houses have recently been demolished and modern homes erected. This programme of re-developement is not yet complete, but when is, Dromore will be one of the finest towns in Province. Indeed, Dromore appears to be on the threshold of a period of growth and expansion. Being strategically placed, only a short distance from the Motorway, and therefore, within easy reach of Belfast, it could well be, that the town is about to become an attractive residential and industrial centre. The Churches, in this community, are likely to be faced with new challenges and opportunities in the coming years. In this Methodism is ready, as in the past, to play a worthy part in offering the unchanging gospel of our Lord and Saviour, Jesus Christ. Benevolent Stewards: Francis G. Silcock. Pew Stewards: Aubrey McCracken, John McCracken. Freewill Offering Stewards: Hugh J. Erwin, James Greer, G. Vivan Brown. Overseas Missions Secretary: Mrs Francis G. Silcock. Home Missions Secretary: Mrs. Hugh J. Erwin. Sunday School Superintendent: Cecil Gracey. Leaders' Board Secretary: David Trotter. Congregational Representatives: Mrs Violet Graham, Thomas J. Irwin, Mrs James Watson. Class Leaders: Kenneth Bowman, Harold Cummings, David Trotter. President: Mrs J. Lennox Booth. Treasurer: Mrs. Hugh J. Erwin. Organists: Mrs Francis G. Silcock and Mrs. Hugh J. Erwin.